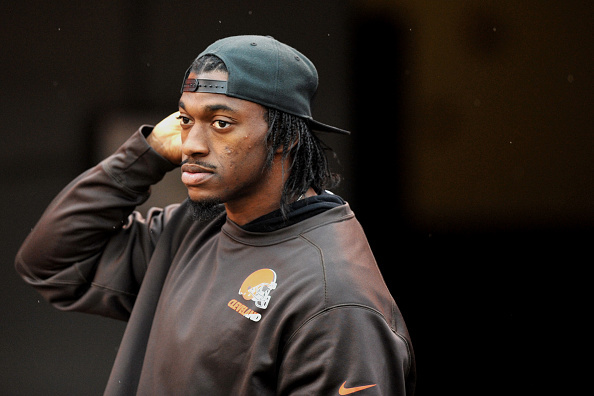 This is the line Robert Griffin III threw out in his first press conference after signing with the Cleveland Browns. He received many questions regarding how quarterback-starved his new team has been in the past few decades, and how much doubt surrounds the idea of him being the one to end the slump. We all know about what Griffin left behind him with the Washington Redskins. An electric rookie year in 2012 made it seem as though he was the future of quarterbacking in the NFL. Three years later, injuries, chemistry issues and a toxic front office had him playing as the scout team safety in Washington last season, never once touching the field. He arrived in Cleveland seemingly a shell of what he once was, needing to be rebuilt both physically and mentally. So, obviously the pressure is indeed on Griffin. For his sake, he’s going to need to start producing diamonds starting tomorrow at the first day of Browns training camp. He can’t afford to do anything less than impress Cleveland coaches from here on out. To his credit, new coach Hue Jackson claims to be hosting a quarterback competition come training camp, the winner of which he won’t announce until right before the team’s August 12 preseason opener. This of course gives off the impression that veteran Josh McCown or even rookie Cody Kessler could win the job should they outperform Griffin. There’s a reason I said “gives off the impression,” though. It’s because this is a competition set-up for Griffin to be the runaway winner. Jackson has made revitalizing Griffin’s career his own personal project. He put the QB through the ringer even before the team signed him, and has gone to bat for him ever since in terms of public support. Though Jackson has always left room for the idea of Griffin needing to win the job, there’s no denying the fact he has the leg-up. While you would think this means the 2012 Rookie of the Year really doesn’t have to blow everyone away at camp, the opposite is actually true. The fact Griffin is expected to win means he has to look more than ready for the job. In fact, you could argue there’s nobody on the Browns roster who needs to have a more impressive camp than Griffin. Yes, the job is essentially his to lose. Yes, he got almost all the first-team reps at OTAs. However, if Griffin looks bad, as though the translation to being a pocket passer is still incredibly foreign to him, it puts the Browns in a very tricky position. Jackson has set the table for Griffin to win this competition, to the point nobody is even really convinced there’s a competition to begin with. What would he do, though, if Griffin struggles in camp while McCown looks like the better of the two quarterbacks (as he did in OTAs)? Would Jackson still just hand Griffin the job, despite his consistent insistence he has to earn it? This is why Griffin has to excel once camp opens tomorrow. He can’t afford to look underwhelming, inaccurate or hampered by previous surgeries. He has to look like the best choice for starting quarterback, or at least a better pick than McCown or Kessler. His winning the job despite hardly earning it not only brings immediate skepticism on Jackson, but also sends a bad message to the rest of the players that the guy leading them on the field didn’t exactly earn the right to do so. Griffin will get ten practice sessions and an intra-squad scrimmage to prove he deserves to start for Cleveland. His coach has given him every possible edge in the competition. It’s up to him to take advantage of this, otherwise his start with the Browns could be just as rough as his final years in Washington.